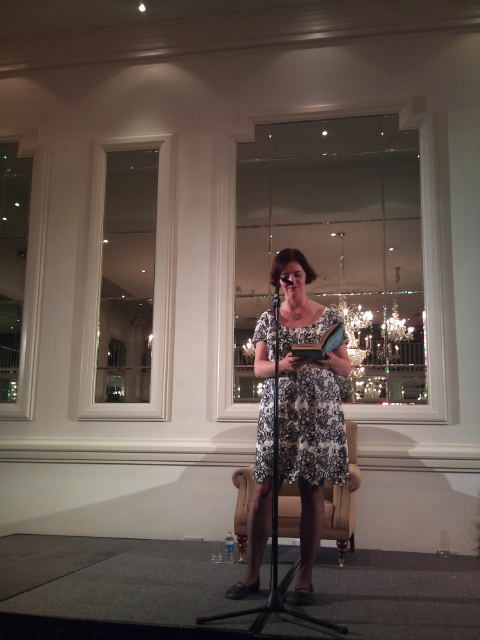 When Emma Donoghue arrived onto the stage of the Meyrick Hotel to rapturous applause it was evident how comfortable and at home she was to be in the company of such an adoring audience. The unprecedented success of her latest novel, Room, secured her the Hughes & Hughes novel of the Year Award; won the 2011 Commonwealth Writers’ Prize regional prize (Caribbean and Canada); Won the Rogers Writers Fiction Award (2010) and was long-listed for the Man-Booker Prize as well as being nominated for the Orange Prize for Fiction. It is no wonder Donoghue is so accustomed to greeting large adoring crowds. Donoghue gave the crowd a generous, insightful and honest account of the creation of Room, of the development of the characters Ma and Jack and also into her own career as a writer coupled with her life as a mother of two children. Of course one of the first points discussed was the influence of the Fritzel case on the novel. Donoghue did admit it of course did stir her to create Room but wished it to be yet separate from the Fritzel story and from the added attention which it would also afford the evil perpetrator of confinement in that real-life case. Felix Fritzel, who is a real-life Jack, was born into captivity. In his walled prison he knew nothing of life or a world beyond his mother, siblings and his captor. Felix was five when he was freed. Jack is five at the start of his story. Donoghue noticed how in a media interview Felix said plainly “the world is nice”, – how a child, obviously scared and bewildered in his new-found freedom had any concept of the “world being nice” provoked thought to what is behind this statement. Donoghue consciously made Jack to be a five-year old: old enough to communicate his story but still, quoting William Blake, full of ‘innocence and expereince’. She made Jack male also to keep the male-female balance even, creating a insight and perspective of all aspects of the story, even citing the likes of Adam and Eve and Mary and Joseph as examples of such a balance in the stories of the history of mankind. It was interesting to hear the influence of Donoghue’s own life as a mother and watching the mannerisms, phrases and actions of her young children, thinking about the comforting and innocent lies all parents tell their children, to answer their inquisitiveness and put their mind at ease while also protecting them, as Ma tries so hard to do for Jack. Also, Donoghue examined the point where the ‘Room’ of the novel, the horrific prison space, which was a nightmare scenario for any adult who has life experience was paradoxically a near ‘idyll’ situation for Jack, who was born into this blind world and the intimacy it afforded him with his mother and the security she strove above all else to provide for him. It was a very touching point. When questioned about the escape scene where Jack flees into which for him is the complete unknown, Donoghue wanted to explore how Jack would see, react and interact with a foreign world and also how Ma would realign herself with her child into a world and society that she left some number of years ago. What would be totally banal to us would be wonderous to Jack. The dilemma for Ma is whether to stay obedient to her captor, keeping jack ‘safe’ in the Room but also unaware of life outside or else risk his life so that he may actually escape and have a fulfilled life experience. Donoghue discussed Room not being an overly descriptive or visual book, the space and characters are brought to life through dialogue and conversation, which is the basest form of human experience and which allows one to share and learn simultaneously. interestingly Beckett’s Waiting for Godot is mentioned as a reference as there also, the action is overshadowed by the conversation, the sharing of stories. Like Ma and Jack in Room, at least there were two of them. For all those who quizzed Donoghue about the possibility of a sequel to Room, that would show how Ma and Jack have adapted to life in modern society, they were met with a considered ‘No’. It is obvious Donoghue has given this considerable thought. She outlined however she thought mother and son had both been through enough and now their lives were as normal and boring as anyone else’s and just wouldn’t make a good book! A consolation prize of a possible film version of Room is a much more definite agenda. She has written a screenplay which at this news arose audible yelps of joy from the audience, but Donoghue teasingly said it won’t hit screens for a few years yet, she wants to safeguard the story and protect it from becoming something it was never meant to be. That level of dedication to her story and characters and near maternal instinct over this book means perhaps Donoghue isn’t so different from Ma after all. 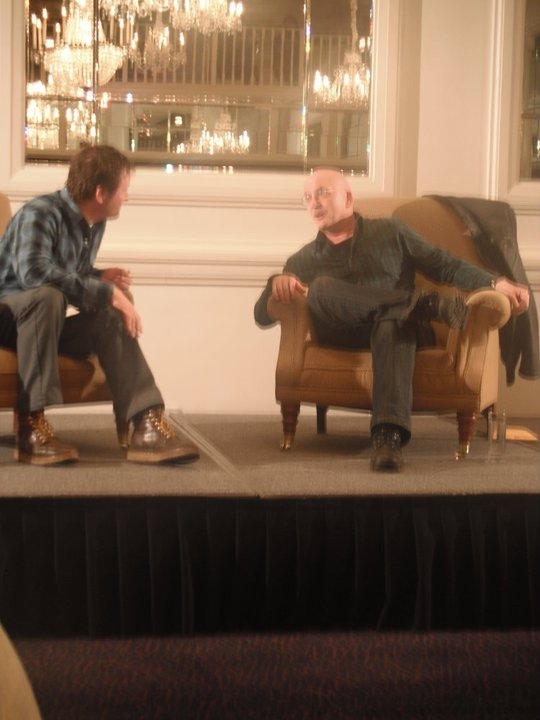 The Meyrick Hotel overlooking Eyre Square in the heart of Galway City played host to an evening with acclaimed writers Roddy Doyle and Willy Vlautin. In front of a crowd of some two hundred people both writers took to the stage and chatted interestedly to each other while waiting for proceedings to get underway. It was this genuine bon-homie between Doyle and Vlautin that made this such an enjoyable evening. Vlautin was first to read, choosing to take a piece from his latest and award-winning (the 2010 Ken Kesey Award for Fiction) Lean on Pete. Published by Faber, the book was received to widespread critical acclaim and looking at the crowd tuned intently to Vlautin’s stories told in his endearing North Western US accent. Vlautin outlined how he developed his love of writing and thanked the influence of his English- teacher grandmother. Describing himself as a horrible student, Vlautin’s grandmother used to read him The Count of Monte Christo and presented him with his own copy of Roddy Doyle’s The Commitments, which set him on course to be a dedicated follower of Doyle’s work. In fact, Vlautin genuinely did seem star-struck to be sharing the stage with one of his literary idols. As Vlautin introduced the character and narrator of his book Lean on Pete, the 15-year old Charlie Thompson, Vlautin explained how he did connect with Charlie as someone who took to the road to travel on the American highways and experience life as he would find it and as it came to him. Lamenting never having a pick-up truck or anything as ‘typically’ suitable to such driving, Vlautin never the less took the road in his ’82 Honda Civic and didn’t look back. In his book, Charlie is a left to fend for himself by his wayward single-father and takes to the road in search of life, acceptance and also a sense of family normality. He ends up tracing the dirt-tracks of Portland, Oregan and gets work at the local racetrack. Here Charlie tends to a less than thoroughbred horse of the title name of the book. The story is rightly noted as being one of the reads of the year and sets out Vlautin as an author as credible and talented as he is a musician. His band Richmond Fontaine have released their tenth album and they played a sell-out concert at the Roisin Dubh last night, also as part of the Galway Arts Festival. Roddy Doyle was introduced to rapturous applause. No stranger to reading at Galway’s Festivals, Doyle read at the 2010 Cùirt international Festival of Literature in Galway. Noticeably pleased to be on the bill at this year’s Arts Festival, he explained how we wanted to take a break from touring this year following the extensive promotion of his novel last year The Dead Republic, but simply could not turn down Paul Fahy’s offer to attend the Festival on the bill with Willy Vlautin. With tongue firmly in cheek he declared to the crowd he was delighted to be back in Ireland’s second best city! Doyle read a short story from his recently published collection, Bullfighting. The story, Animals, is a charming, funny and touching story of family life that can resonate with people from any background or place within the family. Mother, father, son or daughter, it matters not your age as all have those cherished, funny or even heartbreaking moments with those additions to the household: the family pet. In the following Q & A with the audience both writers spoke candidly and indeed gave more time than you would expect to make sure everyone who wanted one got their books autographed and a few words of good wishes to boot. When asked about his writing style Doyle thoughtfully admitted he didn’t have strict guidelines he stuck to when it came to his novels or his short fiction. Simply stating he stayed at his desk in his converted attic “for as long was needed or until it is done, whichever came first”. He did however say he was much fussier at the drafting phase at least, with his short fiction, often writing a paragraph at one sitting, leaving it be and returning to it later. With his novels he would write feverously with the most work coming down the line at the editing phase. The final question of the evening was put to both writers but fielded by Doyle. It asked where is the place of literature and writing for teenagers in teaching in Modern Ireland, which is faced with ever-growing technology, social networks and computer games. Doyle, himself a former teacher, suggested not to worry so much and outlined he has a lot of faith in today’s youth. He sees them reading a lot more than they used to. Their reading may not be big novels read from cover to cover or newspapers from front to back page, but today’s youth are extremely clued into the world and should be trusted. At his writing club for young people in Dublin, Doyle sees so many teenagers coming in and sitting and simply reading and writing for hours at end. Whilst perhaps less the norm it is still proof the desire for great stories is alive and well in today’s younger generations. It was a fitting end to what was a truly great evening. As the crowd wandered from the Meyrick, Doyle could be spotted relaxing and chatting with a pint. It was off to the Rosin Dubh for Vlautin and a concert with his band Richmond Fontaine. It just shows there are few spare moments to be had at the Galway Arts Festival. I have enjoyed catching up with his music as much as I have with his writing and here is one of many great tracks by the four-piece alt-rock/country band based out of Portland, Oregan. Enjoy! Seen through the eyes of loner Thomas Magill, the imagined town of Inisfree is a heinous sin-ridden place where he is moral judge and eternal juror of his neighbours. The Black-Box Theatre becomes the broken-down remnant of the town of Inisfree and also of Thomas Magill’s mind and soul. The play is a frantic and sinister retelling of Magill’s life where all who he interacts with or has some sort of relationship with is retold and relived on loop through the recordings he has made with them. The play opens with a farcical scene where Murphy is driven to distraction by an incessant Doris Day song. For Thomas, this is an early indication that what he is not able to control and correct outs the darker recesses of his personality. Thomas, in his purgatorial world, repeats verbatim the recorded conversations with his beloved mother and relives the encounters with those sinners he meets on his daily walk around Inisfree. He half-runs, half-stumbles his way from tape player to tape player where each plays a conversation from the past. These aural memories become all the more visible through Cillian Murphy truly astounding performance. In such a gruelling one-man performance Murphy is simply outstanding, skipping seamlessly through a host of characters, accents and personalities, none more visceral and provocative than Thomas Magill himself. Thomas keeps a diary of sins of those he meets – a list that includes profanity, gluttony, debauchery and uncleanliness. As Magill considers himself as being next to godliness, he is also canonised as being saintly by his neighbours and simultaneously mocked and jeered for his devotion to his God and also to his mother. I would consider Magill one of the most sinister characters I have encountered on any stage. Enda Walsh has created a man who has visions of his own deism in the face of the spiritual and moral ineptitude on his compatriots. He is, as Thomas himself says, the only kitten in a town full of dogs, or indeed also a vision of Ireland, a broken nation sinking into the sea that supports it, a-la the image on Thomas’ father’s grave. But what exactly is it about Thomas that startles so much. Are we afraid of his temper, his subdued anger and violence that simmers and bursts through to the surface? Are we afraid of his devotion to his religion? Or perhaps is it his religion itself we are afraid of? A combination of all these questions are gelled by Enda Walsh into this enigmatic character, a self-declared avenging angel that is so forcefully portrayed by Murphy. Thomas is a powerless individual who strives to attain what it is exactly he cannot get: power, respect and recognition for his efforts to save those around him from drowning in their own sin. He is constantly told what to do and where to go, be it by his mother, by those around him and also crucially as he is ordered to do by the catechism he preaches and by the God he worships. Thomas is an unsettling individual: to those neighbours around him he is easily forgettable, little more than a passing nod or a wave in the morning. He is anonymous. He is nameless. He is Misterman. The soundtrack is sublimely designed and expertly staged by Gregory Clarke and Donnacha Dennehy. The dialogue that eerily is only one-way: between Thomas and a tape-recorded voice, echoes around the industrial wasteland that is Magill’s own mind. The set design by Jamie Varton uses every available inch of the expansive Black-Box and is ably filled by Murphy. With Enda Walsh himself directing the play seldom dips below a virtuoso piece of enthralling theatre, all leading to a striking and startling final scene. As powerful a scene so portrayed by Murphy you will not readily see on stage too often. It is a fitting tribute to the collaboration between Walsh and Murphy, whose personal touches and input into the play and its development from its earlier 1999 incarnation (then produced by Corcadorca Theatre Company in Cork) makes this a truly unique and special experience. If you want to see a summer blockbuster this year, then it has to be Misterman. 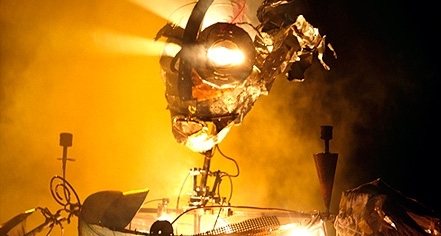 It runs for the rest of the coming week (18 – 24 Jul) but is long sold out. Any return tickets are now recognised as legal currency, trading as gold-dust in Galway at the moment. If you have tickets, hold on to them tightly! If it’s possible for a single group or event to sum up the spirit of the Galway Arts Festival, to really show how it connects to the city, to the West of Ireland and to its people and many visitors, then you need not look past the Macnas parade. This year’s parade entitled This Fierce Beauty attracted huge crowds as the Macnas madness and mayhem snaked its way from the Spanish Arch up Quay Street, Shop Street and along the Salmon Weir Bridge as if heading its way home to the Festival Big Top which loomed and glowed in a blue hue in the Galway dusk. The atmosphere was simply incredible. It was a purely joyous event for the thousands who cheered on the many giant beasts, mystical creatures, drummers, dancers and general unrestrained crazies. Artistic director Noeline Kavanagh has created something truly special for the Galway Arts Festival which has for long now been recognised as just that – special. The crowd was buoyant and in real festival mood as the smoke and flares that signalled the start of the parade. Winged dragons inspired by Da Vinci, giant dogs apparently representing Shane MacGowan and Patti Smith, a huge seated rhinoceros glowering down at the people represented the poet William Blake but perhaps most striking of all was The Girl, an 18 foot tall walking effigy of hope. With her billowing hair and blinking eyes, you felt like you would blindly follow this girl and her crew wherever they were headed. With an unrecognisable Paul Fahy, dressed as a 10 foot tall navigator at the head of the parade, wherever the uncharted waters ahead may lay, we all could do well to folllow Macnas’ lead. Click the link below for images, video and just a hint of what it was like to see “This Fierce Beauty”. Galway, Well, It Loves Theatre! For the next two weeks, Nun’s Island Theatre will be taken over of near non-stop action. With four performances a day those who are caught up in Arts Festival fever will have ample choice to pick from. Groups such as Mephisto Theatre Company, Galway Youth Theatre and Vagabond Theatre Company, among others, are staging a series of works that range from the comedic, the political, the ridiculous to the deadly serious. The programme of events is directed by Páraic Breathnach. Highlights include Mephisto Theatre’s Grenades which starred in Galway earlier this year at the Cùirt International Festival of Literature. A dark but engaging account of life in the North during the Troubles, Tara McEvitt’s play is brilliantly written and delivers a sincere and astute performance from its actor Emma O’Grady. In 2010 McKevitt won the RTE PJ O’Connor Award for the radio version of ‘Grenades’ and in June 2011 won a Gold Award at the New York Festivals Radio Awards. 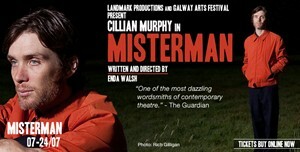 Tara is a participant on The Abbey Theatre’s New Playwrights Programme 2011/12. Grenades has been touring Ireland for the past few months and is a great opportunity to see this play on its return to Galway. Love and Money written by Dennis Kelly is staged by Galway Youth Theatre/Galway Arts Festival. I saw a production of this play in 2008 at the Project Arts Centre by Hatch Theatre Company and seldom has a play stuck in my mind all this time later. The play examines the wreckage lives and relationships are left in when materialism and a culture of greed pervades society and the minds of people that live and interact with each other. A couple struggle in the face of debt to the point where suicide is felt to be the only option as an exit strategy. The play follows the lives of this stricken couple in a reverse and at times askew timeline that runs from debt, death, affairs to love, greed and materialism. In early 2008 this play was eerily resonant in face of what would happen economically in the coming months. Its selection here for inclusion in ‘Galway Loves Theatre’ is an excellent choice and an intimate reminder of where we were and how we were during Celtic Tiger Ireland in comparison to todays more ‘stringent’ times. This will be one to catch. Here is a clip from rehearsal of the production at the Project Arts Centre starring Barry Ward, Kate Ni Chonaonaigh and Will Irvine. In keeping with current trends there appears to be a nationwide Friel season happening. 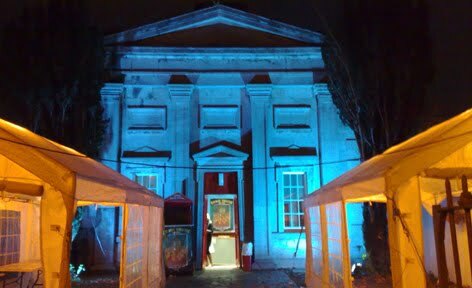 With works by the great Lovers performed by Galway Youth Theatre. Written in 1967 Lovers consists of two self-contained mini-plays, one being Winners and the second being Losers. Following the lives of two couples and the social expectations and moral examination inflicted on them by neighbours and families, Friel presents their experiences through issues such as unmarried parenthood, Catholicism and family expectations, this is a good chance to see one of Friel’s lesser known works.